In true peak-Ironman training, I'm neglecting some not so crucial things, which is getting this posted finally. I wrote it back on August 28 but never put it in blogger. Ever since my 2011 Head for the Cure race I have had this desire to break the 20 minute barrier in a 5k. I never even knew it was a possibility until I crossed that finish line in 20:02. Those 2 seconds have been annoying me for a long two years. In 2012, I tried to break the 20 minute barrier in various races but focus on running a fast marathon just didn’t allow for that level of training. 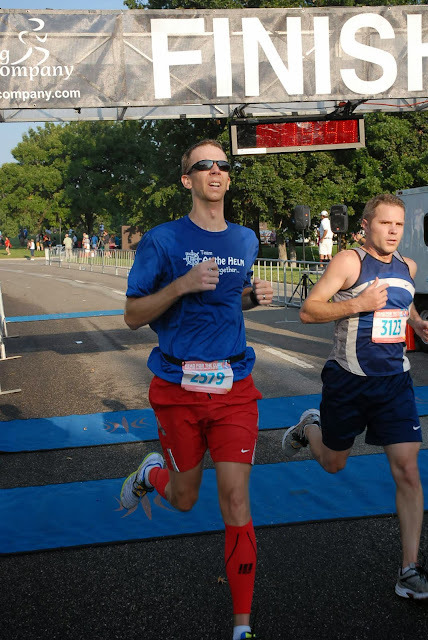 My best attempt was a 20:53 finish that year was at the HFTC 5k. Interestingly enough, I got 3rd in my age group that year! My analysis between the two years is in 2011 I was training for a half-ironman and that the benefit of cross training helped strengthen my legs to get me to 20:02. In addition, I didn’t wear my Garmin in 2011 so I wasn’t constantly watching it, which can actually increase the heart rate. So I’m back into huge cross training mode but with the focus being on super-long distances, I wasn’t sure if that would translate to sub-20. Leading up to the race I continued my training plan but adjusted it for the fact that I was losing Sunday due to the race. This meant a 6 hour training block on Saturday (3.5 hour bike, 2 hour run, plus 30 minutes post-race stretching of me laying on my back trying to ignore the pain). Not the best recipe for running hard on Sunday. We arrived at Corporate Woods around 7:00am after stopping for my pre-race go-go juice. After meeting up with our team (At The Helm), TKB and I met up with our friend Erik (who is Kyle’s bother. Kyle has made a few posts around this blog, notably the Krispy Kreme Challenge). Erik has started running 5Ks this year and increasing to 10Ks and half-marathons! Pretty soon Shane and I took off for about a one mile warm-up jog before fighting our way into the start corral. I managed to get about 4 or 5 feet back from the line. After they let a wheel chair racer go, we soon took off! The course is mostly flat with two noticeable inclines. The first happens within the first mile. I charged it pretty hard (and probably too hard). It curves a bit and there were a few people running side by side. I had plenty of room but when I went between two guys, I heard him quip a bit. Whatever. Talk to the soles. According to my watch, the mile markers were off a bit but I knew with all the trees, buildings and turns it was quite likely my watch was the one off. I should have been doing manual laps because all my splits are rather messed up. I didn’t really look at my watch the entire run. If I glanced down, I don’t remember what any of it read. I just knew that it was telling me the markers were off a bit when it beeped. I just kept pushing. The second hill came near the end of the second mile and it was tough. I was trying to stay with another runner but lost her on that hill. By the time the third mile came around I felt like I was moving around an 8:00 minute pace. It just felt so slooooooow. I just tried to push it as hard as I can so I wouldn’t regret leaving anything on the course. Once we made the last turn and the finish line was in site, I tried to pick up the pace. About 100 yards from the finish another guy had just passed me so I caught up with him and crossed the finish line a half a step ahead of him! I was exhausted, sweaty, and stanky. This was only 3.1 miles, right? After having my timing chip removed, I realized I hadn’t stopped my watch. *Beep* and then walked away. It suddenly dawned on me I was running a timed race that I had a pretty serious goal for and I had yet to even look at the clock! Even though I actually stared at one heading to the finish line! My Garmin 910xt was staring back at me: 19:57. WTF! 19:57!?!?!?! I turned to look at the race clock and it was reading 20:47. Could it be possible?! Not only did it say 19:57 but I stopped my watch late! I also noticed my watch read 3.0 miles instead of 3.1. Was the course really short? Determining that was going to have to come later but for now I had done it, I just didn’t know by how much. After everyone had finished I went hunting for results. Last year I got third place with a much slower time, what might happen this year? As it turns out, I finished in 19:39, crushing that 20:02 for 2011! I also placed 24th overall and 6th in my age group. I was a pretty darn happy! That's the guy I beat by a step but he still finished in 5th before me with a 19:32 race. So what now? Do I leave 19:39 alone or work to improve? I think it will all depend on what else is going on. I'm liking going to be somewhat disappointed if all my future 5ks don't end under 20 minutes but knowing that I was doing massive miles on the bike and swim will likely come into play. So back to the course showing .1 miles short? I looked back to 2012 and it was the same route. Others I talked to indicated it was pretty right on, so I'm going to say this is because of the trees and buildings and my ability to run a good route.